Want to Win a JamStik? One of my favorite pieces of tech in the last years has been the JamStik. I first learned about it from Kevin Honeycutt (an educational speaker, former art teacher, and musician). Oddly enough, the company that makes the JamStik is in Minnesota, not too far away from my home. The latest version of the JamStik is called the JamStik+, which includes Bluetooth Low Energy connection to newer iPads (iPad 4) and MacBooks (2012), and now also includes Android functionality (check your device for compatibility). The JamStik+ also included some extra tools to increase the sensitivity of the device. As it only features the first few frets, the JamStik isn’t a guitar replacement–but it is certainly an educational tool for guitar. Training apps are free to download and turn learning guitar into a game–a realistic “Guitar Hero.” The JamStik also acts as a way to interact with MIDI information for guitarists. If I were teaching guitar, I would be using the JamStik as an instructor–and I still think a classroom set of JamStik devices in a 1:1 school makes a lot of sense (contact Zivix for educational pricing). There are a series of devices that I wholeheartedly recommend…AirTurn, CME XKey Air, Adonit Jot Dash, Apple Pencil–and the JamStik is one of those. Interested in a chance to win a JamStik? They are hosting a giveaway before Christmas–so sign up here and see what happens. Zivix also sells the PUC+ which connects a MIDI keyboard to BLE MIDI, using a battery–a unique solution that works for a LOT of existing products. Zivix also sells AirJamz, a watch-like device that lets you play Air Guitar. The company is always working on ways to bring music interaction to consumers in new ways. Note: I don’t receive any “kickback” for the link to the giveaway–I just figure that it might be worth your time to win one of these great devices. Yesterday morning, a package from Yamaha arrived. That package contained the MD-BT01 Bluetooth MIDI Adapter, the sister product to the UD-BT01 that I reviewed a couple of weeks ago. Why am I writing about BLE MIDI? Why is it important? Why did Yamaha make both the MD and UD versions of this device? So let’s take a look at those questions, not necessarily in that order. As for BLE MIDI (Bluetooth Low Energy MIDI), I consider it a format that revolutionizes MIDI interaction with computers (or mobile devices). I have nothing against MIDI, and I think it is a pretty remarkable standard. Think about it: MIDI 1.0 was released in 1983, which is over 30 years ago. Look around your house or office and ask yourself this: what item of technology is still using the same basic standard that it has used for thirty years? That said, interaction with software and MIDI was always complicated for me. We have MIDI do things it was never really intended to do (which again, is quite amazing) but dealing with MIDI settings and software can be tricky. BLE MIDI does two things. First, it simplifies the MIDI connection process (particularly on iOS Devices). Second, it removes wires. Both of these things makes my life better as a singer, player, arranger, composer, and teacher. It is the single advancement in the past five years (after the iPad) that has real impact on my life. Meanwhile, there are only a handful of companies doing anything with BLE MIDI. I reach out to those companies and ask to test products. On most occasions, companies wish to get the word out. On some occasions, I am nicely told to “take a hike” (most recently by a company that rhymes with “Borg.”) I am grateful for the many companies, in this case, Yamaha, that sends a product that I can test. Back at Winter NAMM (January), Yamaha introduced two new Wireless MIDI Adapters. One was the UD-BT01 and the other was the MD-BT01. These both sell in the $50 range and enable a keyboard without BLE MIDI to have it. The UD-BT01 is a USB adapter, allowing a keyboard with USB MIDI to plug into the adapter (which itself plugs into a power adapter). The MD-BT01 (the subject of this review) simply plugs into the MIDI ports on the back of a keyboard. The MD-BT01 functions in a way that is similar to an older product, the Quicco Sound mi.1. The mi.1 features shorter ports, but each plug is square, whereas the Yamaha MD-BT01 is the same size as a regular MIDI cable. The mi.1 has three flaws at the moment: it cannot connect to the CME WIDI Bud, the square part can conflict with the back of some keyboards (some do not have clearance around the MIDI ports), and it requires a MIDI port that has a powered pin. The Yamaha MD-BT01 only has one of these flaws, which is that it also depends on power from a MIDI port with a powered pin. Some keyboards (particularly those that are older) do not have a powered pin, and therefore the MD-BT01 (or the mi.1) will not work for those keyboards. I also like that the MD-BT01 has a little more cable between the two sides of the adapter than the mi.1. This just offers a little more flexibility when working with the device. The Yamaha MD-BT01 on the left, the Quicco Sound mi.1 on the right. Notice the different in depth and design. I had thought that the longer length of the MD-BT01 (versus the mi.1) could have been a problem when your keyboard was against a wall, so I compared the MD-BT01 to a regular MIDI cable. It turns out that the MD-BT01 isn’t much longer (half an inch) than a regular MIDI cable, so those fears were unwarranted. The MD-BT01 isn’t much longer than a traditional MIDI cable. The MD-BT01 is also labeled on each plug, having an arrow to show which side goes to MIDI IN, and which goes to MIDI out. Plug it in, turn on the power, and you are ready to connect with your device (as long as your device is BLE MIDI enabled). The MD-BT01 connected in the back of the keyboard. As expected, the MD-BT01 connects easily to the iPad (remember, you have to connect using a program that connects to the BLE MIDI device, such as GarageBand). It can also interact with more recent (2012) MacBooks, and nearly any other device via the CME WIDI Bud. I was finally able to get my old Windows device (Asus T-100) to connect to BLE MIDI devices with the WIDI Bud (I needed to use Notion to do it). That said, it is time to give that old Asus away, as it cannot handle 64-bit programs (like Finale). As another tip, George Litterst let me know that there is a program to update the firmware of both the MD-BT01 and the UD-BT01. You can find that app (iOS) here. It is an iPhone app, but it does run on iPads, too. One of the great things about this app is that you can rename the device (if you were going to be running multiple BLE adapters, which is possible). However, you have to re-rename the device every time you update the firmware (the firmware restores the original name). Incidentally, George created a iOS MIDI guide for TimeWarp, which may be of interest to you. Now: the big question: do you need one of these? If you have an older keyboard without BLE MIDI (which represents most keyboards), I think there is significant reasons to add that capability. Right now there are four ways to add BLE MIDI to an older keyboard: The mi.1, the UD-BT01, the MD-BT01, and the Zivix PUC+. I can’t really recommend the mi.1. At one point, it was less expensive than other options, but that really isn’t true any longer. The device is in its third revision, but in my tests I could not get the mi.1 to connect to the CME WIDI Bud (although it does connect to my iOS devices). Even though it is in its third revision, it still has the same design and flaws as I mentioned earlier in the article. The MD-BT01 (the focus of this review) is something I can recommend. Its form factor is the similar to the mi.1, but different enough that port clearance is never an issue. It comes from a well-respected manufacturer, and is priced fairly. It works with the WIDI Bud, which mean that you can make a Chromebook, old MacBook, or Windows computer into a BLE enabled device. The only time the MD-BT01 might not work for you is if your keyboard lacks a powered MIDI port. In that case, see the Zivix PUC+. The UD-BT01 is basically the same device as the MD-BT01, but requires a USB connection and a power adapter. If your keyboard is new enough to have a USB MIDI connection, it likely also has a powered MIDI port, so honestly, I don’t see why you would choose the UD over the MD. That said, I do have a couple of keyboards that only have a USB port (such as my Akai LPK-25, which is still available) that requires external power, and the UD-BT01 can work with that device. Like the MD-BT01, the UD-BT01 works with the WIDI Bud. It is also priced in the $50 range. The Zivix PUC+ is a BLE wireless MIDI Adapter that has its own power source (AA batteries), a single MIDI port, and USB connectivity. The positive thing about the PUC+ is that it pretty much works with anything you throw at it, as it provides its own power and is unleashed from wall plugs. In terms of negatives, it uses batteries and only has a single traditional MIDI port. It sells for $99. If your keyboard has MIDI without a powered port or USB MIDI, this is the solution for you. Don’t you love that we have all of these options today? All four options work with iOS. 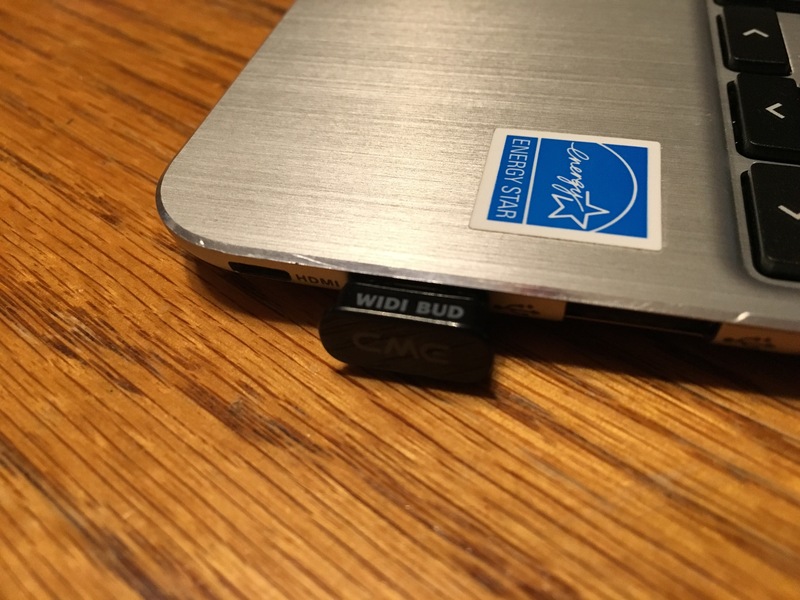 And again, don’t forget the WIDI Bud, the small USB adapter that turns most non-BLE devices into BLE capable devices (including old iPads, but the iPad USB camera connection kit would be required). It really works (and is also $50)! The WIDI Bud can make your old computer/tablet into a BLE equipped tablet. Let’s say you have an old MacBook and an “old” Keyboard (with USB). For $100, you can add BLE capability to your setup without having to buy a new MacBook and keyboard. In the short run, that saves you $1700 ($1200 MacBook, $600 keyboard). Back to the topic at hand: the MD-BT01. Yamaha has made an attractive and pragmatic wireless MIDI adapter that can be attached to your existing keyboard through its MIDI ports to turn your old keyboard into a BLE MIDI Keyboard. As long as your keyboard is new enough to have a powered MIDI pin in its MIDI port, this is a great device to purchase. This review is for the Yamaha UD-BT01, available around $50 from many vendors. In a pre-summary, this is a device that needs to be plugged into a USB power adapter, but then allows a MIDI instrument that normally uses USB MIDI to connect to a computer to become a Bluetooth Low Energy (BLE) MIDI device that utilizes BLE MIDI to connect to a computer/tablet/phone which allows BLE MIDI (a feature found in newer iOS and Mac OS devices). In short, BLE MIDI is low latency and has no cords, which is a huge benefit when working with a computer or tablet. This review requires me to travel back in time a few weeks, when I reviewed the CME XKey Air and the CME WIDI Bud. After posting a review, a reader e-mailed to let me know that the Quicco Sound mi.1, the Yamaha UD-BT01, and the Yamaha MD-BTO1 did not work with the CME WIDI Bud. I was able to verify that my 1st generation mi.1 did not work with the WIDI Bud, but I could not verify that the Yamaha devices did not work. As a result, I did what any blogger would do–I reached out to Yamaha and asked for a review unit. Yamaha graciously sent out a UD-BT01 for me to work with. It arrived yesterday and I have been working with it for a day. The UD (can I just call it that for now?) is a USB dongle of its own that is not meant to plug into a computer. Instead, it is meant to receive a USB cable from a MIDI instrument, and then the UD is meant to plug into a USB power adapter (whatever you have on hand–my Apple iPhone USB brick worked just fine. So…the UD is made to receive a USB cable (we call this a “female” adapter) and to plug into an adapter (“male”). The UD-BT01 connected as it would be used…USB from the instrument, UD-BT01, and into a standard USB power adapter. Put another way, this adapter needs to be plugged into a power source to work. Therefore, if you need wireless capability without having to attach it to electricity…the UD will not be your device. If that is the case, see if the Zivix PUC+ might work for you (It is important to note is that the PUC+ can use either USB or traditional MIDI connections). Two examples of potable keyboards where a plugged-in solution may not be best are the Akai LPK 25 or the (original) CME XKey, both which normally communicate to a computer/tablet through a USB cable, drawing power through the USB cable. Back to the UD, If you happen to have a power source near by (and you will for many keyboards), this adapter is a nice solution to convert an existing device to a BLE MIDI device. My MacBook isn’t new enough to run BLE MIDI and my Chromebook does not have BLE MIDI. As a result, I connected the UD to both devices via the CME WIDI Bud. The WIDI Bud connects by itself to the first device it senses , so you need to make sure that you only have the device that you want to use (should you have multiple BLE MIDI instruments in your procession) turned on. In both situations, the WIDI Bud connected to the UD just fine, and I was able to work with Notion and GarageBand on my MacBook, and Noteflight, Flat, and SoundTrap on my Chromebook. As for Windows, my Windows device is an Asus T-100 Transformer, and it simply doesn’t work well (It is slow and was cheap. You get what you pay for). I bought that device a few years ago to be able to help music teachers with Windows computers. The T-100 does not have BLE MIDI (and I am not even sure that BLE MIDI is yet incorporated into Windows 10), and the WIDI Bud just doesn’t seem to work well with my computer. Using CME’s WIDI Plus app, I can connect to various devices and the UD shows up on the bottom of the screen as a MIDI device nearby, but I cannot connect to it. One of the joys of Bluetooth Wireless MIDI is that it takes a lot of the complexity out of MIDI connections. Connecting with an iOS device or a Mac, or even a Chromebook with a WIDI Bud, is fast and easy with no cables to worry about and no messing around with MIDI settings (sometimes you have to select the WIDI Bud as an Input/Output device on a web app, like Flat.io). MIDI was always a pain on my Windows computers (I was a convert to Mac in late 2008) and it looks like it still is today. The UD works as expected and doesn’t get hot, so I would leave it plugged in most of the time without worrying about it. The adapter is small, and wouldn’t take well to being stepped on. Therefore, make sure the adapter is somewhere out of the way where it will be stepped on or crushed (e.g. We had a floor power source for my old Yamaha Clavinova Baby Grand, so that would not be a good place for the UD to live). There is a hole on the UD, and I am not sure what it is for. I wouldn’t want to put it on a keychain, but I imagine a number of them could be stored by running a twisty-tie through that hole. $50 is a low price to pay to convert an existing MIDI instrument to a BLE MIDI instrument–so you may find this a good solution for you. You do not need to have a Yamaha piano to use this device. 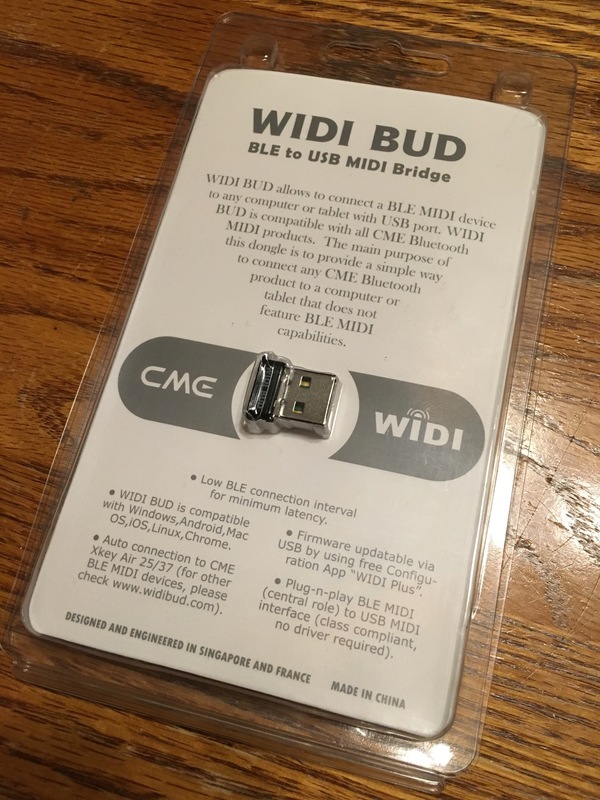 If you have an older Mac or iOS device, or a Chromebook and would like to turn it into a BLE MIDI capable device, consider the WIDI Bud from CME (See B & H, who carries it). As a reminder…an old iOS device will need the USB to 30 pin Camera Connection Kit to plug in the WIDI Bud. In summary, the UD-BT01 is a great solution if you have a keyboard with USB MIDI that plus into the wall and you want to make it into a BLE MIDI device. If you are dealing with a portable keyboard, this really isn’t the device for you (you can make it work, but you need to be near a power socket), and as Yamaha reminds you on their packaging, the UD requires the use of a USB power adapter (i.e. the brick that likely charges your phone). There was a time that I would have said, “Yamaha should include the power charger,” but USB chargers can be found anywhere and you can likely find a spare one in your home, or it is easy enough to just go buy one. I love to see all of these options for Bluetooth MIDI, which I feel is a significant improvement to the old way of dealing with MIDI instruments. A very special thank you to Yahama for letting me test out the UD-BT01, which was introduced at Winter NAMM in early 2016. I received an e-mail from a reader who has a WIDI BUD and they wanted to bring up some specific issues with the device, and I thought it would be good to share their observations with you, as well as a few of my own after my own extended testing today. In my last post about the XKey Air and the WIDI BUD, I talked about how the WIDI BUD can link to other BLE MIDI devices. This is not always true. I was able to connect Zivix products to a WIDI BUD on Mac, Chromebook, and Windows with no problems. I did not try the Quicco Sound mi.1 MIDI to BLE MIDI dongle that I have in my home, and I can verify that the mi.1 does not connect to the WIDI BUD at this time. Likewise, the reader mentioned that the Yamaha MD-BT01 and the Yamaha UD-BT01 do not connect to the WIDI BUD. (Update 8/3/2016) Yamaha was gracious enough to send me the UD-BT01, and I was able to connect it to the WIDI Bud on both my old Mac (without BLE MIDI) and my Chromebook. So far, I am not able to get the WIDI Bud to work with my old Asus T-100 Transformer Windows computer. I don’t know why this is the case–but if you have the mi.1, the WIDI BUD will not work for you at this time. I do not know if a future firmware update can solve the problem, but I thought it was worth mentioning. The other item that the reader wanted to bring to your attention is that there are some apps that modify the functionality of the WIDI BUD available for download directly off of CME’s website. They also wanted to highlight that documentation for the WIDI BUD and its accompanying software leaves much to be desired. I am not troubled by this issue at all..BLE MIDI is still a relatively new feature, and I am hoping future firmware updates can solve these problems. This is a long review, and I apologize for the length, but I am very fond of these items and they deserve some coverage. If you want to read a very quick summary, check out my last post. I also had to publish an incomplete draft in order to add in-document links, so if you received e-mail notification about the post and it was incomplete, I apologize. I love technology, and I love teaching others about technology in relation to what they are doing in their classrooms. I have a special affinity for technology that “changes the game” and makes technology easier to use or easier to incorporate into our lives. As a music teacher and a musician–there are few occurrences where I am bursting with excitement about a product. This is one of those situations. This review is going to look at a CME’s XKey Air and the CME WIDI BUD. You can click on either of those last two links to skip to the section about that product, and there is a (20 minute) video at the end of the review. If you want to buy these devices, visit the CME Website. Whie the WIDI BUD website is “live,” at the moment, the only place to buy the WIDI BUD is B&H (This will change over time). Special thanks to CME and Virgin Musical Instruments for making these products available for this review and for the sessions that I will be presenting in the 2016-2017 academic year. The XKey first came to my attention in late 2014, as a representative from CME (or more specifically, their distributor in the United States) contacted me about the product and their coming attendance at TMEA. While the company has been around since 1993, the current CME was formed in 2012. 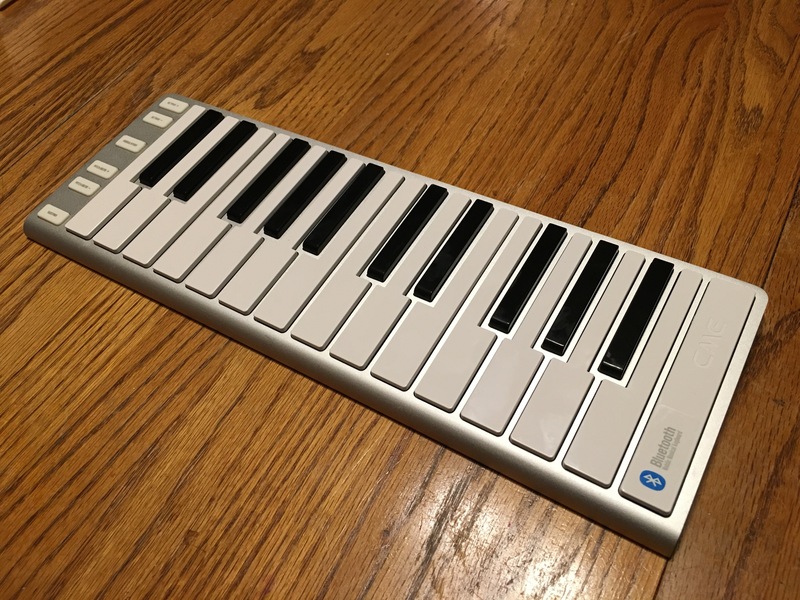 After reading some reviews on the Internet, I can’t tell when the original XKey came out (my best guess is 2014) as a high quality portable MIDI keyboard. The features of that keyboard included high quality materials, full sized keys, function buttons (instead of wheels), velocity-sensitive keys, and low-travel keys. While the keyboard can be used for performance, the target was portable studio and notation work–something it is perfect for. I remember stopping by CME’s booth at TMEA, seeing the XKey for the first time, and showing them the Miselu C.24 keyboard. I asked them to consider BLE (Bluetooth Low Energy) MIDI with their keyboard. At the time, my C. 24 was one of the few of those devices “in the wild” as they sent it to me early so that I could show it at various music education conferences. Just a word about the C.24–I lost mine in Nashville at NAfME. The C.24 was an exciting device as it was the first BLE MIDI device on the market. It promised to be a device that could be used as an iPad cover, and featured the ability to “flip” the device into form to make a playable keyboard that worked with magnets (not springs). You could combine multiple units to make a longer keyboard. The keys were scaled on an old model of a “woman’s” piano (apparently, piano keys used to be a relative item, based on the desires of the purchaser versus an industry standard). The C. 24 works, and is still available from Miselu at a (now lower) cost of $149. I do worry about the durability of the C. 24 (all the moving parts to flip open the device) and the future of the company (it still hasn’t released a promised control module to backers)–plus the function of the case changed when Apple changed the design of the iPad and the C.24 could no longer be used as an iPad case. This means that the market is still open to a high quality BLE MIDI portable keyboard, and the XKey Air fits the bill. In addition to my feedback, CME heard that same feedback (“Please add BLE MIDI”) from a number of users, and ran a Indegogo Campaign to provide the capital to start that product. That project was funded by August 2015, and started shipping this spring. In form, the XKey Air and the original XKey are identical. In fact, the only difference would be a Bluetooth sticker on the XKey Air, as well as multiple LED indicators and a power button on the Air. In my video review, I talk about the packaging of the XKey Air, which may seem irrelevant. After all, why does the packaging matter? I don’t know why, but it does. Part of the joy of buying an Apple product is the unboxing experience, which was carefully designed for the user. The XKey Air comes packaged in the same thoughtful way as an Apple device, and would fit perfectly on the shelves of an Apple Store. There are a couple of instruction sheets in the box, as well as a labeled micro USB cable. If you have other micro USB cables in your house, you can use them with the XKey Air–but I like having cables labeled so you know what device they came came with. As for the keyboard, it is a joy to use. It pairs effortlessly with BLE MIDI on the iPad. As with most BLE MIDI devices, it is instantly detected by the iPad and connects with a single touch. While the keys do not have the tradition “travel” of a piano keyboard, they are pressure sensitive and every button works as it should. 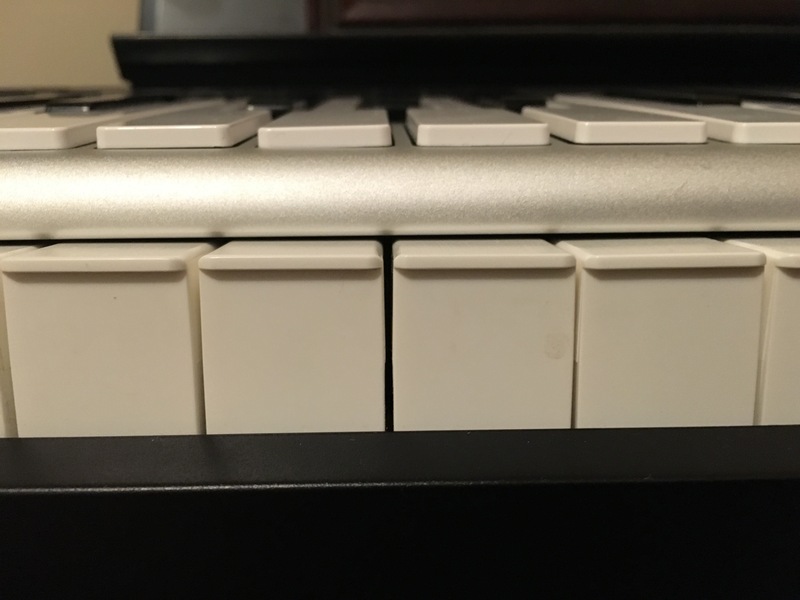 Some reviews of the original XKey longed for a way to attach a sustain pedal to the keyboard (instead of pressing a key on the XKey Air), but this is a portable keyboard–attaching cables and secondary pedals defeats the portable purpose of the keyboard. The low-travel keys should make the keyboard more resilient to throwing it into a backpack and running along. I had issues with other previous portable USB keyboards that I have used over the years (One example was an M-Audio 25 key unit that did not stand up to portable use). Like traveling? The XKey series of keyboards has low travel compared to a tradtional keyboard. The travel isn’t neededd for this kind of work. My only complaints about the XKey Air are minor. First, the 25 key model costs $199, and the 37 key model costs $299. The original 25 key XKey is $99, and the 37 key XKey is $199. As both a consumer and a music educator, I would love to see the price point drop on these models. That said, if you have an original XKey, you can attach a Zivix PUC+ to it and make it a portable BLE keyboard for the same cost of $199. In other words, the price point isn’t terribly inflated, but I would still love to see a small price drop . I would imagine that some kind of education pricing (for the original XKey or the XKey Air) could be obtained if you reached out to the company. My other complaint is that it would nice if the XKey Air included a light bag of some kind to offer protection as you throw it into a backpack. Is it worth buying the XKey Air for $100 more than its equivalent XKey? It depends on what you want to use it for. The XKey Air is an ideal device for anyone wanting a portable MIDI keyboard interface without wires. When I am working with my iPad or my MacBook, I prefer not having to deal with cables. Additionally, an iPad needs a USB dongle (an additional $29 purchase) to work with a a USB MIDI keyboard. If I were creating a school MIDI lab with fixed computers, I would consider the original XKey (even above a comparable M-Audio product). They are going to look great in your lab and will hold up to the rigors of daily use. This would also be true if I was teaching with Chromebooks…you probably are not going to buy a WIDI BUD (more on that in a moment) for each Chromebook. However, if I needed keyboards for a 1:1 iPad school where student iPads were the MIDI lab (not a separate room), I would consider the XKey Air (even at $100 more per device). Why not go truly mobile with your lab? Also, if I was the teacher and I did any work at all in GarageBand (SoundTrap, Soundation) or notation programs, I would want a portable keyboard, particularly if the device I was using was a portable device (MacBook, iPad, Chromebook). As a warning, in a 1:1 scenario, each XKey Air has a unique MAC Bluetooth address, but show up as “XKey Air 25 BLE” on the Bluetooth MIDI interaction panel. This would make connecting difficult–much as we found with our Bluetooth QWERTY keyboards in our 1:1. If every device has the same name, how do you know which one you are using? Zivix has a unique identifier with every name, so I know it is possible to uniquely identify each BLE MIDI device, and I hope that CME is able to add this functionality in a future firmware update (if it isn’t there already, which I may have missed while looking through they XKey app). In short, I think both CME XKey keyboards are wonderful. They are high quality portable keyboards and a far better solution (in my opinion) than mini keyboards like my old Akai LPK 25, my old M-Audio key stations, and even the Miselu C.24. Do you need the BLE MIDI feature? That’s up to you–I would say, “Yes,” because if you want to add it later, you can (Zivix PUC+) for relatively the same price-but then you again need cables (of a sort) to use the feature. It is wonderful to be able to connect without wires to your iPad, MacBook, Windows laptop, or Chromebook. I do wish the pricing was a bit lower on the XKey Air ($150), but $199 isn’t terribly out of the ballpark. When I spend money on devices, I have to ask if they save me time and frustration in the long run over doing things another way. In the world of iPad, the XKey Air allows me to connect to my iPad without a dongle (as it would to a newer Mac [2012?] than may 2008 Aluminum MacBook) which is a separate $29 purchase. It means less time to connect and take down, and less things to forget going from place to place. 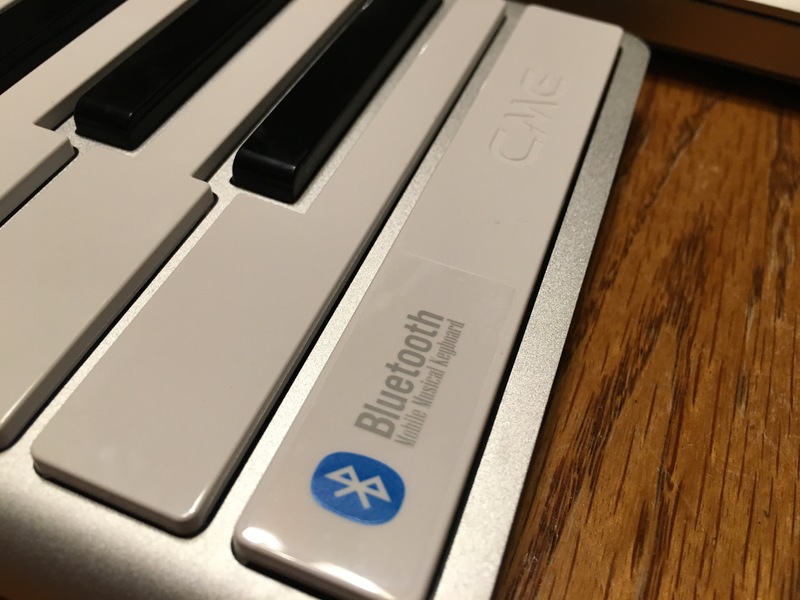 So if you are going to use a keyboard with your computing device–in terms of convince, it simply may be the best option to spend an extra $100 for the Bluetooth capability. So yes, if you are interested, either the XKey or the XKey Air is a “consider buying” item. That initial reaction was really, really, really wrong. It is going to be a while until BLE MIDI is packaged with every device. If you have a newer iPad or MacBook, you have it already–but old Apple devices, many Windows devices, most Android devices, and most (all?) Chromebooks do not have BLE MIDI capability. This little dongle, which looks like a newer flash drive, gives BLE MIDI capability to nearly every device. This means that you can use an XKey Air with an older iPad, MacBook, Windows computer…you get the idea. There are limitations (you have to be running Windows XP SP3, Ver 4 of Android, iOS 4.2, Chrome 43.0) but generally, if you have a modern device, the WIDI BUD can add BLE MIDI to your computing device if it does not have it. Last summer, Web MIDI was announced, and over the last year, programs have been adding it: Noteflight, Flat.io, SoundTrap to name a few. 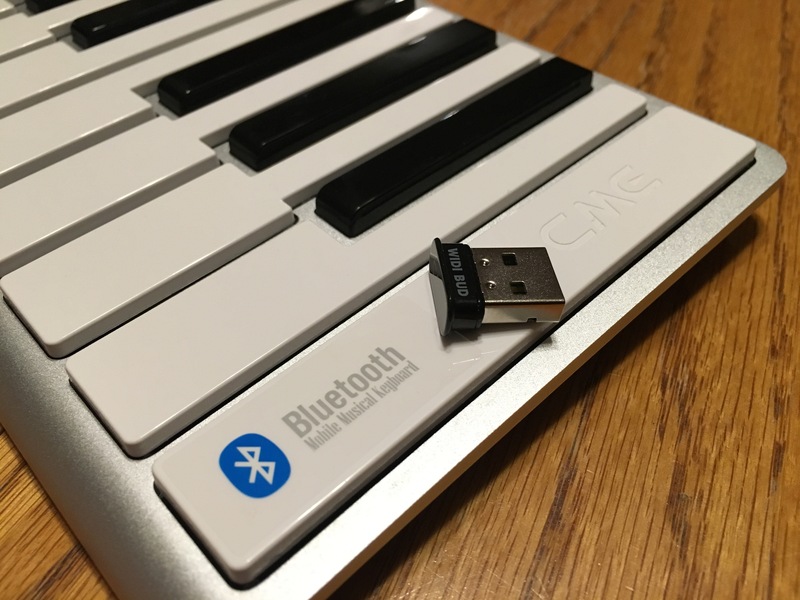 With this dongle, you can make a Chromebook into a BLE MIDI device, utilizing Web MIDI on these programs. Sure, you can also add a wired USB connection, which is what you would do for students (you would have a stack of physical keyboards that they would check out, use, and return). But for YOUR use…go wireless. Trust me on this one. What is amazing is that the WIDI BUD makes a connection with a BLE MIDI device on its own. I haven’t tried having two BLE MIDI sending devices turned on at the same time, so I do not know how the device would respond to two competing devices for its attention–but plug in the WIDI BUD, and turn on the XKey Air, and it works. That’s it. The WIDI BUD will remember that connection until it loses power. So, if you want to connect another BLE MIDI device (such as the JamStik+ or the PUC+), turn off the XKey Air, turn on the JamStik+, and plug in the WIDI BUD. So…the JamStik+, the PUC+, the Korg MKey Air, and the few keyboards sold with BLE MIDI…should be able to work with the WIDI BUD. Note: This statement was not true. It turns out that the Quicco Sound mi.1. See more at my follow-up article. The WIDI BUD in use, in a Chromebook. Check out the video…it works! I have now said this for over a year…reliable MIDI interaction with a BLE MIDI device is a game changer in ease of use and functionality. 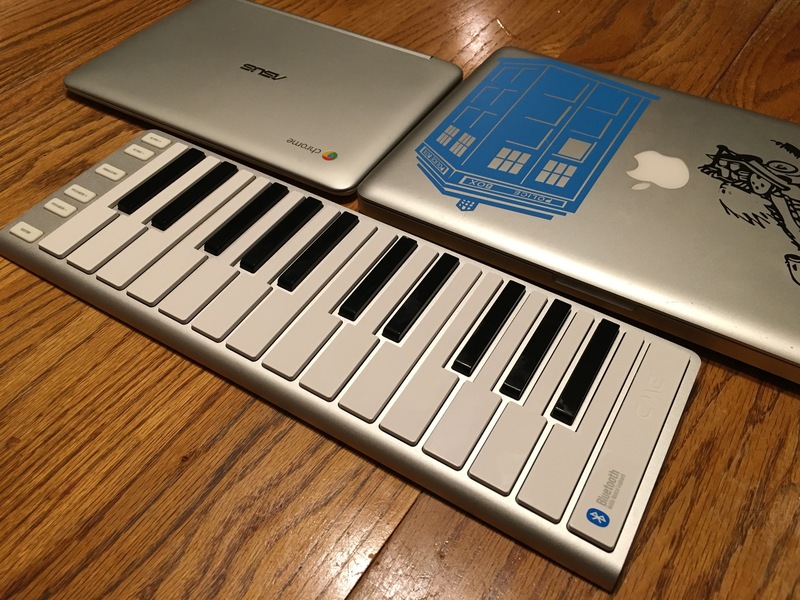 Chromebooks being able to use MIDI keyboards over a wired USB connection is a major step forward, and it means that I could teach Music Theory (mostly with Noteflight or Flat.io) with Chromebooks, and I could teach a Music Technology class (SoundTrap, Soundation, Noteflight, Flat.io) using Chromebooks. But to be able to connect wirelessly means that using those programs for my own use (not just in teaching) becomes a possibility. Being able to use any BLE MIDI device with just about any host computing device is a game changer, too. At that point, you are only limited by the apps and programs that are available on your computing device. And remember…on Chrome OS, the best apps require a subscription to get all of the features that you want to use (Noteflight requires a subscription to even use MIDI recording). I don’t think there is anything wrong with that, because companies deserve to earn money. But it is something that we need to teach IT departments as they typically don’t plan for annual subscriptions. My only complaints about the WIDI BUD are the size of the device (it has to be that small, but people will lose them), and they are a TIGHT fit in your USB port (which is probably intentional so that you leave it plugged in). I am leaving this WIDI BUD in its package after I use it, so that I can keep track of it. My only other complaint is that I can’t find the pricing for the WIDI BUD on CME’s website, so I am hoping that it is released soon and will be affordable! As you can tell, if you have a computing device that does not have BLE MIDI, I think the WIDI BUD is a must buy. I don’t know anything else like it on the market. Thanks again to CME and Virgin Musical Instruments for allowing me to review and show off these devices. A video appears below.